Fifth graders from Corning, IA get a taste of what it is like to be a farmer and how ethanol plays a role in the ag industry. Despite growing up in a small, rural Iowa community, 10-year-old Owen Paul doesn’t come from a farm family. He’s never seen first-hand the daily work required to run a farm. He hasn’t spent hours riding on a tractor with his dad or grandpa. He really hasn’t had much exposure to the realities of ag life at all. But thanks to an innovative community outreach program developed by POET Biorefining – Corning, Owen – and his fifth grade classmates at Corning Elementary – got a taste of what it would be like to be a farmer and how ethanol is transforming the ag industry. Owen was part of the first class of Corning students to participate in POET’s Watch Me Grow program. The Watch Me Grow program was developed by Greg Olsen, General Manger at POET Biorefining – Corning, and his team as a community outreach initiative. Despite being a part of the Corning community since 2007, Olsen said many people don’t know POET’s story. “Although we stay actively involved in the community, many people don’t really know what POET is and what we do,” Olsen says. The Corning team could have held an open house or had its employees speak at community events, but they wanted to do something a little outside the box – “something that would make a lasting impact,” Olsen says. And they wanted to have fun, too. That’s when they decided to combine community outreach with an educational program for elementary-age students. “We wanted to get them involved in something that was not only fun and educational, but would also help us get into homes with our message,” Olsen says. The program kicked off at the beginning of May 2016, with 31 then-fourth grade students. Planting had to be postponed once due to wet conditions – something all farmers can relate to – but the students were nonetheless enthusiastic about the job. POET prepared the field, but each student was responsible for planting 12 or 13 seeds in his or her row, marked with a plastic name tag. It was dirty, hard work, but the kids didn’t mind. 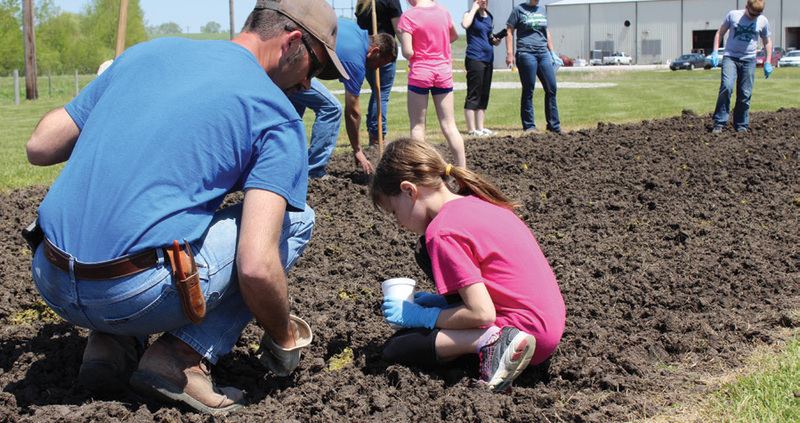 “They had a great time planting corn,” Olsen says. Then, it was a waiting game. Being patient, of course, can be harder than the actual physical work – especially for a kid. To make sure the excitement for the Watch Me Grow program didn’t fade, POET mailed each student a newsletter every two weeks. The newsletters were designed to be fun, with games and activities for the kids and lots of information about agriculture and ethanol that they could share with their parents. The mailings also included some sort of small gift – like a rain gauge or a POET hat – that tied into the theme of that newsletter. Mostly, though, POET wanted a way to share updates on the corn they planted since the kids wouldn’t be able to see it grow during the summer months. No one was more excited than the kids, says Travis Paul. The newsletters were highly anticipated. In October, the corn was finally ready to be harvested, and POET invited the students and their families back to the plant to get a first-hand look at how much the corn had grown and to celebrate. But first, the kids had some work to do. After all, the job of a farmer is not complete until the corn is in. “We had the kids harvest the corn by hand – we just had them pull off whatever ears they could,” Olsen says. To complete the exercise, the kids sold their corn to POET’s Grain Buyer. Each student received $3.10 – the value of a bushel of corn. After the harvest, the kids and their families got a tour of the plant. They were able to see everything from a truck coming in to dump a load of grain and the automated control room to the high-tech lab. Hands-on learning like this is so important for kids this age, says Corning fifth grade teacher Allison Thomas says. The tour was eye-opening for parents, too. “I had no idea how many products could be derived from corn. I knew about the animal feed, but there are all these other uses for corn, too. That amazed both of us,” Travis Paul says. Though the program was initiated by POET Biorefining – Corning, it evolved into a true community effort, Olsen says. Farm Bureau Financial Services, Crop Production Services and Adams County Farm Bureau also got involved, helping provide expertise and materials to the outreach project. While not an immediate objective of the Watch Me Grow program, the activities also helped introduced the fifth graders to different career options, Thomas says. While POET is certainly based around agriculture, the plant also needs professionals like chemists and engineers. Students can live in the Corning area and still pursue a career in these fields. “Opportunities for jobs in those areas exist here, too,” Thomas says. While the Corning fifth graders won’t have to think about their future careers for a while, they won’t soon forget what they learned in the Watch Me Grow program. Owen Paul does. The young farmer – if only for a summer – can’t stop talking about planting and harvesting his corn, Travis Paul says.